When I read this article, I have to admit I just kind of nodded and expected it. I mean, having worked in corporate tech support for over a decade, I know first hand that great suggestions are hardly ever implemented. Those who are higher up on the food chain — never mind that they may not have worked in the trenches for years — are always the ones who know best in corporate life. But, even if you’re a corporation, you are not corporate. In fact, there’s a good chance that you started your business to get away from corporate life. So why then, are you still acting like it? Take a moment to look down in the lower left-hand corner of my website. See that blue “help” button? That’s the first line on my customer service system. It connects to an awesome tool, one that will allow me to answer questions, keep track of information, and even build in a knowledge base and FAQ eventually. It’s a customer service system. Even if you have a “contact me” page on your site, you have a customer service system. The question is, do you have a good one? Luckily there are some questions that will point you in the right direction. Is it easy for someone to contact you? I cannot tell you how many times I’ve gone to someone’s website in order to reach out to them or even inquire about their services and I can’t find a “contact me”. If they can’t find a way to contact you, then you’ll lose out on sales. Are you able to keep track of emails? No matter how organized your inbox is, if you’re losing emails or not sure about conversation threads, then you need a better system. This is what CRMs are designed to do, but they’re only as good as the information that’s in them. Do you have policies in place for handling suggestions? In the article I cited above, a simple and good suggestion ended up earning a letter from an attorney. You may worry that someone will sue you if you take their suggestion, so having policies in place will ensure that this threat is minimized. Even saying “thank you, we’ll take it under advisement” is a policy. Taking time to answer those three questions will ensure your customer service procedures work for you and help earn you customers. 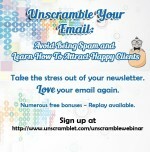 Want to know more about how to use email to attract happy buyers? Check out my upcoming webinar.